“It’s a little like a spaceship has landed,” said Steve Jobs. Drone footage surfaced over the weekend of Apple’s new Cupertino headquarters, which has been under construction since 2013 and is expected to be ready to move into by next year. Apple Campus 2 was originally proposed by Steve Jobs, who invited Norman Foster, the acclaimed British architect, to design the campus on a 176-acre site that is supposed to accommodate 13,000 people. The central building is a four-story ring with a giant park proposed in the center filled with hundreds of fruit trees. The new campus will also include a 100,000 square-foot workout facility, a 1,000-seat underground auditorium and a huge underground car park, leaving space for miles of cycling and walking trails. Apple aims to make the campus completely sustainable on renewable energy. The drone footage reveals some of the 700,000 square feet of rooftop solar panels being installed on the main building, which also features the largest piece of curved glass in the world. 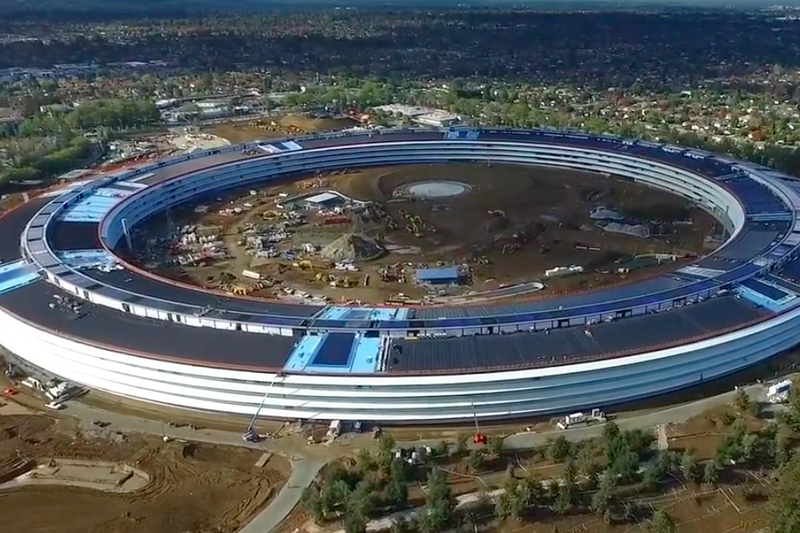 Watch the latest drone video of Apple Campus 2’s progress shot by Sexton Videography.